Electrical power in the solenoid is required to the turn the magnet OFF. Power is removed to restore the magnet to ON. Pull force conversion (approximate):- 1kg =10N = 2.2lb. Outer shell is a sturdy bright nickel plated cylinder, passivated with body mounting. They are designed for demanding clamping applications. The Energise to Release Electromagnet is an electro-permanent design – a solenoid (wound copper coil) within a high quality high permeability iron assembly for high clamping forces and low magnetic losses plus a magnet build into the assembly. The iron cylinder of the energise to release electromagnet is of sturdy design with a bright nickel finish passivated with body mounting. Armature plates (keeper plates) exist to suit each energise to release electromagnet unit. The energise to release electromagnet has one central tapped hole on the rear face. Depending on the size, the energise to release electromagnet has two styles of electrical connection:- Hirschman connectors and Hirschman style connectors. 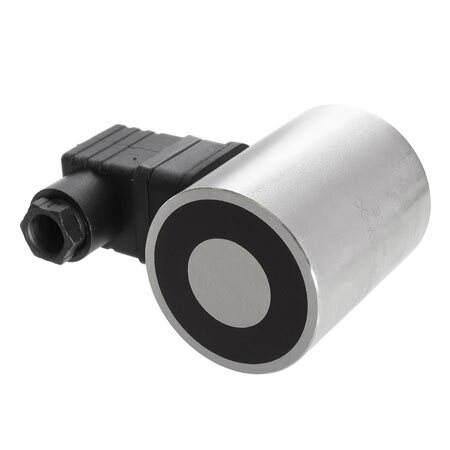 The Hirschman connectors and Hirschman style connectors can be unscrewed to allow the connector to be rotated in 90degree increments to allow the power cable to join the electromagnet in a direction best suited for each application. The energise to release electromagnet has,depending on the size, two supply voltages:- 24V dc and 240V ac. The energise to release electromagnet has aDuty Cycle of S2. The energise to release electromagnet has an IP rating of 54. The energise to release electromagnets have maximum possible pull force ratings from 250N up to 500N (25kg to 50kg / 55lbs to 110lbs) depending on the size of unit (the actual pull achieved will depend on the application).